Description: I was at home and preparing to sleep when it happened. The town flooded by evil zombies! My car is parked at the other side of the town and I must get there at all costs! It is the only way I can survive.I took my gun from the drawer and went outdoors. It will be a difficult night. 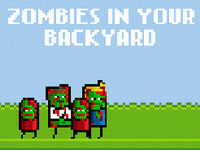 In the game you are fighting with the zombie enemies. The main goal of each battle is to reduce to zero enemy's lives and keep your lives bigger than zero. Instructions: Each turn you should try to find the longest path of same blocks on the board. 2. move cursor over the same blocks. 3 release the left mouse button. The shortest path should be minimum three blocks length. When you released a path, the length is subtracted from the zombie's lives. If you want to cancel your selection, simply move mouse cursor outside the board.